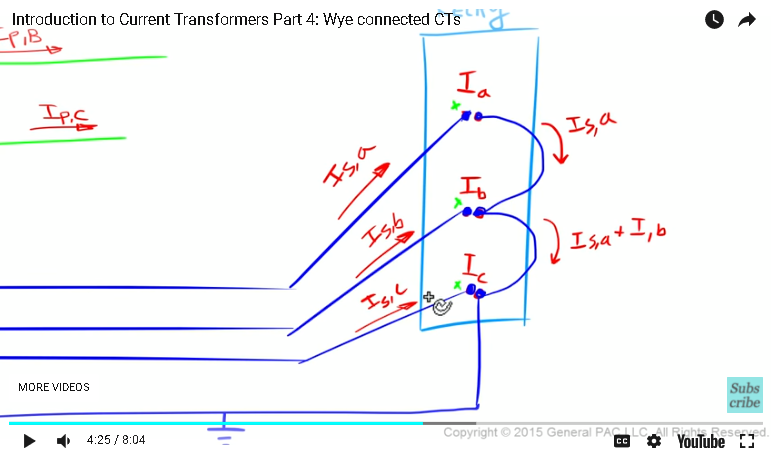 In part three, we drew an ideal transformer like this. 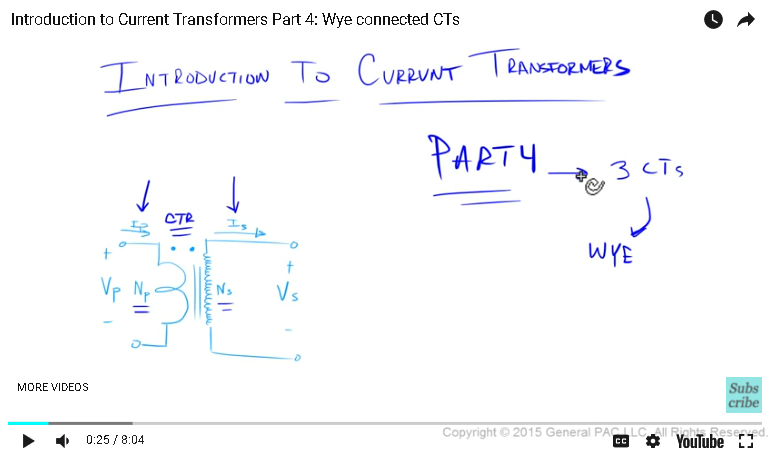 We talked about the primary current, the secondary current, the number of primary turns, and the number of secondary turns, and defined the CTR or the current transformer ratio. In part four, we're going to take three CTs and connect them in the WYE connection. Okay, we'll first begin by drawing our conductors. Our conductors look something like this. This is phase A, this is phase B, and this is phase C. Our CTs essentially look like this. Now, think about these CTs as a window-type CTs that we talked about in the last module. The window-type CTs have a window right in the middle of it and the conductor essentially flow right through this window. Our primary current, our primary phase A current, flows through like this. Similarly, primary phase B current flows through like that and primary phase C current flows like that, which means that this side is a source side and this side is the load side. Okay, our CTs, let's draw this out like that. This right here is the polarity markings of our current transformer. The CT leads come out like this. Our relay looks something like this. On our relay there are input terminals for phase A, B, and C currents. We'll draw them like this. This is for IA, this is for IB, and this is for IC. Now, oftentimes, one of these input terminals are designated as the polarity side. We're gonna designate this side as the polarity side of our input terminal, which means the polarity side of our phase A CT, which is this lead here, should be connected to the polarity input terminal of our relay, which looks something like this. Similarly, we'll have the polarity side of our phase B CT connected to the polarity input terminal in our relay. 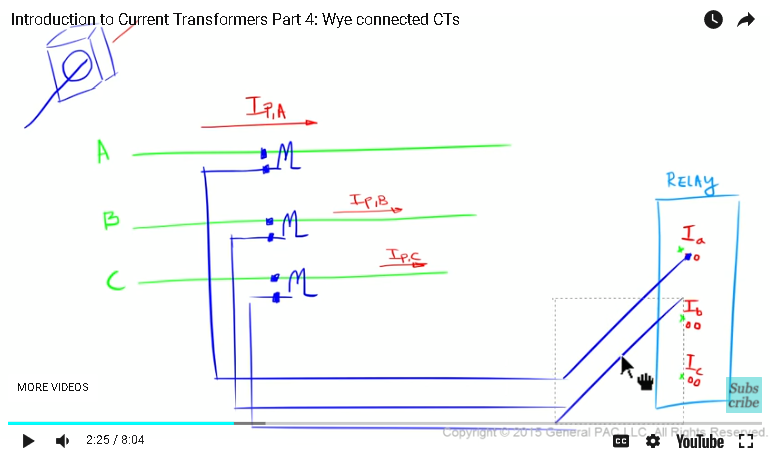 Lastly, we'll do the same thing for phase C. Since our goal is the connect these three CTs in WYE, we have to take the nonpolarity side of phase A, phase B, and phase C CTs and connect them together like this. The nonpolarity side of our input terminals of our relay must be connected like this. One of these points here must be grounded. We're going to talk about this ground point more in depth in a different module, but in this module, let's focus on these currents right here. We know since the primary phase A current flows into the dot on our primary side means that the secondary phase A current must flow out of the dot on the secondary side. Similarly, secondary phase B current must also flow out of the dot on the secondary side and secondary phase C current must also flow out of the dot on the secondary side. Secondary phase A current flows into the polarity-marked input terminal in our relay. Same thing with phase B current and phase C current. What comes out of the nonpolarity side from our phase A input terminal is essentially phase A current. Now, let's zoom in here to get better look. Okay. What goes into the polarity-marked input terminal for phase B is essentially the secondary phase B current. But what comes out of the nonpolarity side is essentially phase A current plus phase B current, which makes sense, right? Phase B current flows into the polarity side of the input terminal here, phase A current flows into the nonpolarity side of our input terminal there, and what comes out is the sum of what goes in, which is phase A current plus phase B current. Similarly, for phase C, what goes in is the secondary phase C current but what comes out is the sum of what goes in, which is the secondary phase A current plus the secondary phase B current plus the secondary phase C current. It's the sum of what goes in. What circulates, then, is essentially phase A, phase B, and phase C current back to our CT circuit. Now, for a balanced set of three phase currents, we know that phase A current plus phase B current plus phase C current is essentially zero. If this is unclear, underneath this video there's a link to a different module that explains this in much more detail. Now a lot of the times, it helps visualize what's going on when I draw this exact same circuit but from a different perspective. That's what I'm going to draw now. This is going to be super fast and it's not going to be annotated. 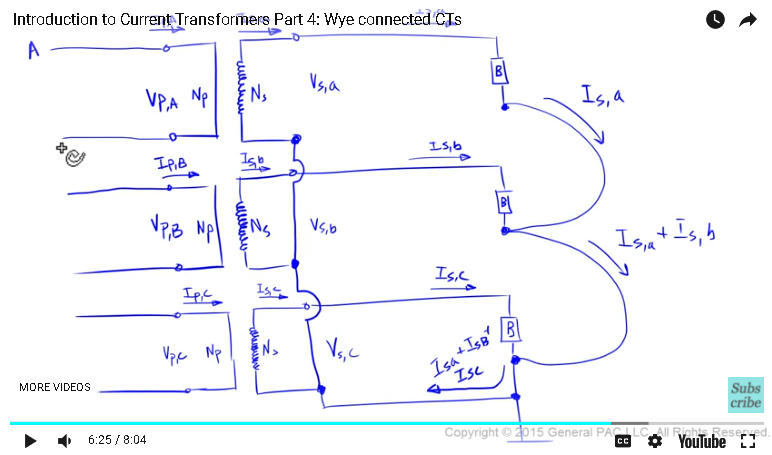 Okay, in this module, we drew the three phase CTs connected in WYE and then we looked at the current that are going into the terminal inputs of our relay. We found that the current that's actually circulating is IA plus IB plus IC and we realized that for a balanced system, IA plus IB plus IC is essentially zero. There is not current that's circulating here for a balanced system. Then we also drew this circuit here. This circuit shows how the CTs are connected and how the X1 bushing is connected to the burden, or the relay input terminal, and how the X2s are connected together to form a WYE-connected CT. Similarly, we showed how the nonpolarity side of our input terminals are all jumpered, essentially, together and they're jumpered and connected to the nonpolarity side of our CTs. In part five, we're going to go through this exact same procedure but we'll look at connecting the CTs in delta instead. Thank you! 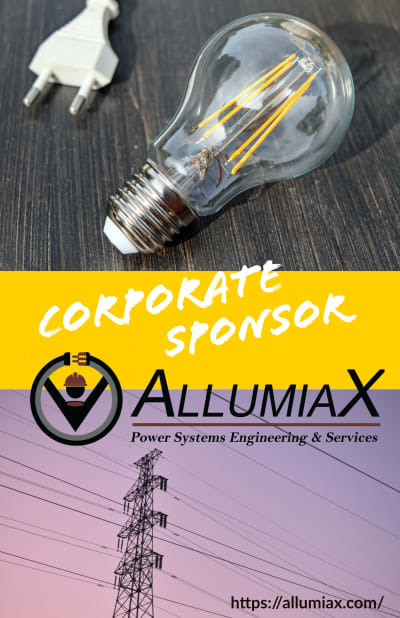 This module was brought to you by GeneralPac.com, making power system protection, automation, and controls intuitive.